Unionists could have a clear majority in six of the 11 new ‘super councils’ in the north of Ireland, an independent elections expert has calculated. But amid reports of increasing disaffection from electoral politics in some republican and nationalist areas, there were warnings that control of Belfast council could revert to unionist hardliners without a strong turnout by nationalists and republicans. Figures show that a repeat share-out of votes from the last local government election would put unionists in control of the merged authorities at Armagh Banbridge and Craigavon; Castlereagh and Lisburn; North Down and Ards; Mid/East Antrim; Antrim and Newtownabbey; and Causeway Coast and Glens. And based on the same extrapolation, nationalists could have a majority on just four of the councils - Derry and Strabane; Fermanagh and Omagh; Mid-Ulster; and Newry, Mourne and Down. There should, however, be a continued unionist/nationalist split on Belfast City Council with Alliance again holding the balance of power. Nationalists would be expected to have 27 seats, unionists 24 and the Alliance Party nine in the new 60-strong council, based on the share-out of votes in 2011. The final results are expected to depend heavily on the turnout of voters from each community as well as on how many voters transfer their votes. The voting system used in both the local and Euro elections is the Single Transferable Vote and people are encouraged to mark the ballot papers 1, 2, 3 for as many candidates as they wish. Renowned elections expert Nicholas Whyte said that given current electoral trends, the DUP and SF should be in best position to benefit from the carve-up of the new councils. “That is because of the way people vote, not because of where the lines are drawn on the map,” he said. 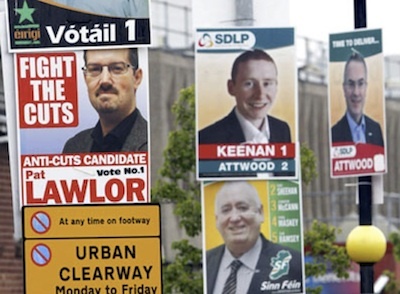 The Six County election campaign saw some bizarre twists in its final week, with the new moderate unionist NI21 suddenly redesignating itself as neither unionist nor nationalist. The redesignation is only relevant at the Stormont Assembly, but the announcement by party leader Basil Mccrea still caused upheaval among his unionist colleagues. The NI21 deputy leader John McCallister went so far as to describe his own party as “crazy” and “dysfunctional”. Meanwhile, the nationalist SDLP was in chaos in Derry after council candidate Jimmy Carr was ousted from the party’s list of officially endorsed candidates on the eve of the elections. The SDLP’s decision on Tuesday came after it was alleged messages about drugs were found on a tablet computer he was using. Mr Carr said the SDLP had accused him of being a drug dealer. He said he was the “victim of a witch hunt” and would now stand as an independent. “I wasn’t wealthy enough or middle class enough for certain elements within the party,” he said. And in an apparent last-ditch attempt to prove his party’s credentials with unionists who may be tempted to support rival unionist parties, the leader of the DUP, Peter Robinson, ranted about the ‘cowardly’ Provisional IRA at Stormont. “Those who shoot people in the back and have done so in the past” were the cowardly ones, he said. Speaking in the Assembly, the first minister rejected an allegation from Sinn Fein’s Martin McGuinness that unionists were afraid to condemn the hate-crimes of unionist paramilitaries. He challenged the Sinn Fein assembly members sitting on the opposite benches to raise their hands if they believed the IRA had exhibited cowardice. “Not one, Mr Speaker,” Mr Robinson triumphed, before listing a number of the more controversial IRA attacks throughout the conflict. Tensions between the DUP and Sinn Fein over a range of disputes on major issues facing the power-sharing executive in Belfast have predictably intensified in the lead-up to the elections. Mr McGuinness said that the DUP was motivated by fear of losing votes in working-class loyalist areas in this week’s government elections. He responded to Robinson by accusing the first minister of “retreating into the past”. “When I talk about a failure of leadership and political cowardice, I am talking about the here and now,” Mr McGuinness said. “I am talking about the failure of unionist leaders to stand shoulder to shoulder with the rest of us in denouncing the squalid sectarian and racist violence of the UVF. The failure to name and condemn the UVF. The attempts to divert attention and implicitly excuse the UVF in a quest for extreme loyalist votes.